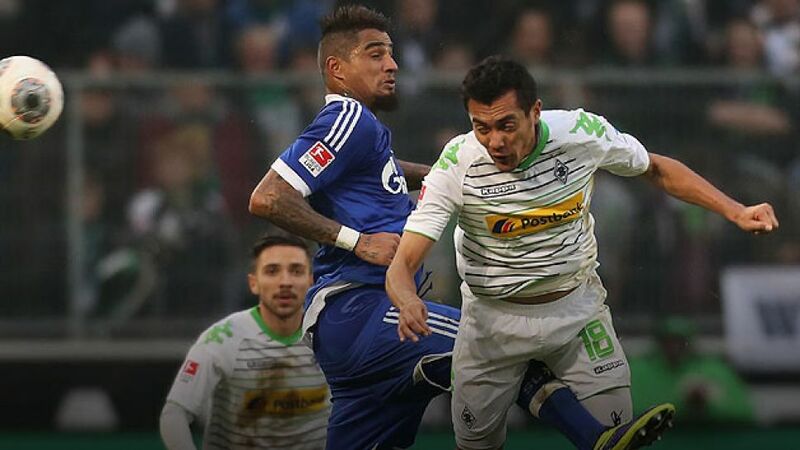 Gelsenkirchen - Both FC Schalke 04 and Borussia Mönchengladbach find themselves in a must-win situation coming into Matchday 32’s curtain-closer (kick-off 15:30 GMT/17:30 CET), with the visitors desperate to keep their UEFA Champions League qualification hopes alive and the hosts embroiled in a long-distance battle for bragging rights against arch-rivals Borussia Dortmund. The Royal Blues have to match the result of Ruhr neighbours Dortmund to retain any hope of finishing above them this season, even if head coach Jens Keller was uninterested in talk of other teams. “If we continue picking up our points, our competition can do what they want,” said the 43-year-old. In terms of personnel, Schalke’s injury woes continue to worsen in spite of Max Meyer being given the all clear, with Klaas-Jan Huntelaar (throat infection) a doubt and Jefferson Farfan (allergic reaction) expected to join the likes of Kyriakos Papadopoulos on the sidelines. Gladbach head coach Lucien Favre, meanwhile, has a full squad to choose from, with the exception of Granit Xhaka (suspended), after defenders Martin Stranzl and Oscar Wendt made their respective comebacks in training.